It must be the week for updated ESC’s! Speed Passion have released an updated version of their successful Reventon esc, the Reventon Pro 1.1 EX. Measuring up at a measly 35 x 35 x 20 mm it features a low profile fan (only 26.5mm with the fan), and the ability to operate on 1 or 2s. It is rated to 140A and includes a 6v, 3a BEC. Novak have released details of their Pulse V2 and GTB V3 ESC’s . The Pulse is retaining it;s place as the Novak flagship ESC with updates to the hardware and firmware. They have designed the V2 to be more adjustable, have higher performance, be able to handle heavier loads and be more robust. The GTB V3 looks to be nearly completely redesigned with an on board bank of capacitors, no timing at all to avoid problems with spec racing classes and a host of updates to the venerable GTB 2 platform. What 2wd Buggy for 2014? I’ve seen it said by the boys at Action RC, and I tend to agree, that in Australia, 2014 will be the year of the buggy! In 1:10 there seems to be a renaissance in the number of people racing not only in 1:10, but in Buggy as well! Certainly I know I am looking at stepping into the 2wd buggy ring, so I thought I would have a bit of a wander through some of the offerings form the big players in the game! Today i’ll focus on the kits available, however there are some great priced packages available in RTR that I will have a look at another day. The RC10B has been a dominant buggy in the 2wd arena for decades, and the latest iteration brings us a pair of twins in the form of the B5 and B5M. Whereas the B5 retains it’s composite chassis and rear mounted configuration, the B5M is a completely different kit rather than a single configurable kit and moves to an alloy chassis for the mid mounted configuration that is becoming popular for high traction surfaces such as sugared clay and carpet. A ball differential and 12mm big bore chocks means that this kit is right up to date with the technology used by it’s competitors. Battery choices are a little different here as the B5 and B5m are designed for Shorty, saddle or square packs rather than the long running standard stick packs. So keep that in mind if looking at these twins. Another unconventional option from Associated is the RC10 Worlds edition that was recently re released by Team Associated. In some areas vintage racing is becoming popular and what better to use than a world championship winning design. Team Losi, and in recent years, their racing arm TLR, is another of the old boys in the Buggy arena, with the latest offering, the 22 2.0 Buggy being a popular, and robust buggy. With parts to configure the 22 in the conventional Rear or Mid Mounted position the 22 was one of the first 2wd buggies able to be configured both ways. Until the 22 most 2wd buggies were only available as a mid mounted configuration through specialist conversions, but with some clever engineering the 22 was able to do it all. With a narrow aluminium chassis, ball differential and a very compact configuration this is a favorite with many drivers. The original 22 is by no means outdated or uncompetitive either so keep an eye out for good 2nd hand examples. One thing to consider however, if you have stick packs, it is a very close fit, if it is able to at all, to run a stick pack in the mid mount configuration. you would be better off with a shorty or saddle pack batteries with the 22. The latest iteration of their buggy, the RB6 is the latest in a long line of evolution for this buggy. The RB6 features an aluminium chassis, mid or rear mount engine configurations and the velvety smooth shocks that Kyosho’s race vehicles are famous for. Taking any battery configuration, this platform can be configured to work in any environment. The HB 2wd buggy is, umm, sorry, there isn’t one! While HPI/HB have a killer 4wd buggy in their stable, nothing more than prototypes have appeared in the last decade, so if you are a HPI/HB fan, i’m afraid you will have to look elsewhere! Not a name many are familiar with, but this Japanese manufacturer has a long history in RC. Their B-Max2 is a configurable mid/rear mount configuration on it’s alloy chassis and takes a shorty, saddle or square battery pack. All in all it is a world class vehicle. Another manufacturer that doesn’t have the profile that it should in Australia, but some drivers are starting to use them. The Spyder SRX-2 MM and RM are separate models, not a configurable one. Serpent have stuck with composite chassis for both their Mid Mounted, and rear mounted models. Big Bore 12mm Shocks, and a 3 pad slipper clutch along with a host of innovative design details make the Spyder a buggy worth considering. Schumacher has been around for a long time, but doesn’t have the international racing program, or scale of some of the other ig players, but make no mistake, it plays with the big boys on the track. A small operation in the UK, Schumacher is a household name in RC Racing in England. With Rear mounted and Mid mounted Buggies scattered throughout their racing history, they offer three fantastic buggies in their Cougar 2wd lineup. The Cougar SV2 is a conventional alloy chassised buggy with a ball differential. Great for indoor tracks of any kind the motor is just in front of the rear axle, much the same way that the DEX210, and TLR 22 are. However the Cougar KF takes this a step further as it is a belt driven buggy with the engine mounted a lot neared to the middle of the vehicle. Some are calling this a front mount, but really it is more of a true mid mount. With a gear differential and Carbon Fibre chassis, this car is a high traction specialist. Because of the belt you do need to run saddle packs, however with an optional tensioner you can run shorty packs sideways. Rear mount fans do not despair, as the Cougar KR is also available with alloy chassis, gear differential, and a black anodised look that makes other buggies quake in fear. Can you tell that I love the Schumacher buggies! Whilst Team Durango is a relatively new name in the pits, they have certainly made a name for themselves quickly with quality products at fantastic prices since their 2008 arrival. Originally building low volume specials, Team Durango now boasts a full range of vehicles, and their latest 2wd, the DEX210V2 is no slouch boasting a huge range of configuration possibilities at a good price. Rear and mid mount configurations are available out of the box mounted on an alloy chassis and fitted with a ball differential. Xray have long been known for their Luxury RC kits, however in off road, their presence had until recently been confined to the 8th scale arena. However the release of the XB4 and the XB4 2wd, that all changed. Using the platform to the 4wd XB4 to create a 95% commonality of parts, the XB4 2wd essentially has had the front drive shaft removed. So basically a true Mid mount like the Cougar KF, but with a shaft rather than belt drive. Saddle Packs are the name of the day because of the drive shaft configuration. A multi flex alloy chassis with composite chassis frame is fitted to allow chassis flex to be tuned to the track conditions. Gear differentials rather than ball differentials are also fitted, although an optional ball differential is available. As with anything else, there are a range of buggies available from Tamiya, from originals such as the Frog and Hornet through to more modern alternatives. The TRF201 is their 2wd offering, but honestly, I don’t know anybody that uses one, not that it is a bad kit, just other choices for the most part are more popular. That is a tricky question, and the answer depends on a lot of questions. For example, rear mount buggies tend to perform better on loose surfaces such as dirt or clay, whereas Mid Mounted buggies tend to be quicker on high traction surfaces such as carpet, astro turf or sugared clay. Parts availability is another factor, so check out what your local hobby store has. Of course there are always online stores, but we encourage racers to support their local stores. Major manufacturers such as Team Associated, Losi and Durango tend to have parts more readily available in stores and online. However Action R/C for example, not only have great parts for their Schumacher vehicles, but are super helpful and always willing to help and answer questions. Other configurations depend on personal preference such as Gear vs Ball differentials, and whilst many kits come with one or the other, mostly the opposite is available as an optional part. Batteries may be an issue of you have a stock of stick packs for example, then you might look at a kit that can use them as well vs those that can not fit them. There is nothing wrong with a 2nd hand kit of a previous generation of the buggies that I have mentioned above. Often they are fantastic value, and if bought locally come set up for your track! RCtech for examplle has a large Australian buy and sell section, as do most local clubs, so keep an eye out for a bargain, after all it is more about the driver than the car that they are wheeling. The main thing is to get something, get out there, and most importantly, have fun! 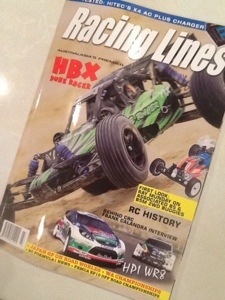 Many of you would be familia with Australian magazine Racing Lines, and if you aren’t you should be! The March edition is about to hit shelves packed with news, reviews and opinion. This month that includes a review of the Hpi WR8 Flux, the HBX Dune Racer, a first look at the B5 twins, as well as a review of the very useful looking Hitec x4 AC quad battery charger. There is also reports from Australian and Asia pacific race meets. So find an edition at your local newsagent and buy a copy! One of the best parts of this page is you can also see results from past events and photos and reports where available. However the focus of this post is this weekend, when there are no less than five major Australian events happening, and one international event in Thailand. Starting on the northernmost event, there is the TITC Event being held at Huge RC Circuit (it is a real place, and very impressive, check it out https://www.facebook.com/pages/Huge-RC-Project/345117058918017 ) for 1:10 EP Touring Cars, FWD, F1 etc. A major international meet for the region attracting some big name drivers, and I believe some Australians. Next there is round two of the SEQ 12th Tour being held at Logan on the 22nd of Feb. In 8th Scale off Road, the GP and EP vehicles are hitting the track to see who can claim the King of the Vally title being held at MORCC in NSW. A little further south, and somewhat to the west, the 8th scale off buggies are hitting the track in Port Lincoln for the Neo+ SA Challenge for Round 1. In Victoria the Victorian Cup Series for F1 cars kicks off with round 1 being held at Templestowe. And most southerly, but not least, the AARCMCC Tasmanian EP Off Road state titles are being held at the Goodwood Club just outside Hobart. So if you can’t find a place to race or spectate at an RC event this weekend, you probably need to try a little harder!